This past August was my very first pantry challenge. Shopping was allowed, but three meals a day were planned for one week at a time, concentrating hard on what we had in the pantry. In the end we added a couple new recipes to the cookbook (pesto risotto and simple Spanish rice), shaved 24% off our average grocery budget and ate all sorts of random items from the pantry to make room for more real food. The challenge came shortly after we realized the dangers of hydrogenated oils. This near-plastic lab-created ingredient is in so many different foods, it’s nearly impossible to buy anything and assume it’s safe. With these dangers fresh on our minds and an urge to clean out the fridge (an inevitable side effect from the challenge), our own version of “Chopped” occurred in our kitchen. Nutritional labels were scanned, ingredients listed were read one by one. Could it survive the challenge of not containing partially or fully hydrogenated oils?! 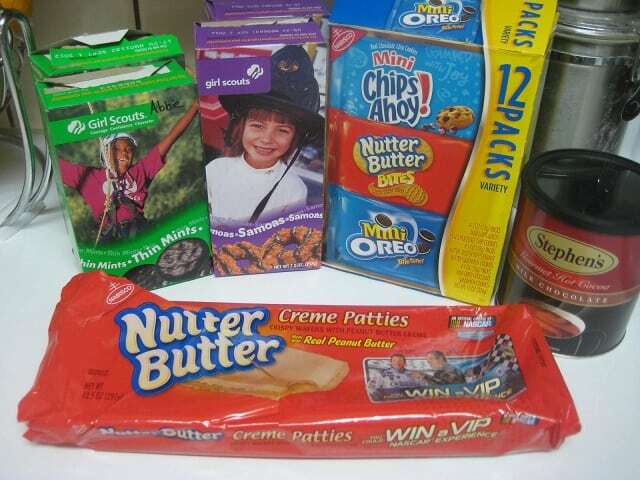 The test: Did the item in question contain the word “hydrogenated” in the ingredient list? The action: Throw the item away. No ifs, ands or buts. The goal: Rid our house of hydrogenated oils. 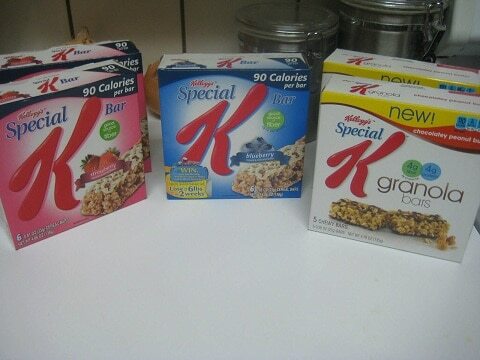 I bought these Special K bars earlier a few months back thinking they would be an easy, portable snack for us while we’re running errands or spending the day away from home. I found them a bit too sweet for my taste, but the kids didn’t mind. Unfortunately, these contain partially hydrogenated palm kernal oil and thus failed the test. And it’s no wonder why they’re so sweet – there are five different types of sweeteners are listed in the ingredients! There really isn’t a need for these or any other store-bought granola bars. My family loves my homemade version so I’ll just spend a few minutes and working my arm muscles around those oats in my kitchen. Ah, the adored girl scout cookie. Are you drawn to those little girls in those cute uniforms who ask oh so sweetly if you’d like to buy a box of cookies? My husband sure is. Imagine his disappointment when we found partially hydrogenated palm kernal and/or cottonseed oil in our favorite Samoas and Thin Mints. See that red and black canister to the far right? That’s Stephen’s Gourmet Hot Cocoa. Can you believe there was hydrogenated oil in hot cocoa? And in the GOURMET version! I mean, what exactly does the manufacturer gain by doing this? A traditional cup of hot cocoa can be made using unsweetened cocoa, salt, vanilla and milk – and that’s exactly how we’ll be making ours this holiday season. The Nutter Butter Crème Patties up front and center were leftover from Nana’s most recent visit. These are a favorite of hers, which means she’s given them to the kids and somehow they ended up in one of their take-home-bags (the ones filled with all the completed crafts and treats they made during the visit). I didn’t have the heart to toss them out while the kids were watching me unpack their bags, so the package went into the pantry. The hydrogenated oils in these patties are actually found in the peanut butter that’s inside the patties. A shame too since these are just so darn tasty! The 12-pack of Nabisco mini-cookies was a no-brainer. This was also a gift from Nana, although not the most recent (which makes me question how old these cookies are). I knew the Oreos were contaminated and mere fact that the Nutter Butter sandwiches shared the same parent name as the crème patties made them guilty by association. Playing it safe, I tossed the whole box. My family and I prefer popcorn made on the stove, but there usually is a package or two of microwave for those ultra-lazy nights where standing for 5 minutes truly was longer than I was willing to stand. Want to know how Jolly Time makes butter-flavored microwave popcorn taste like butter? Hydrogenated oils. The Nabisco Premium Saltines were a shocker. These are almost always in the house for Mr. Crumbs. He rides his bicycle to work three days a week and often needs a little something-something to hold him over until dinner (or dessert). The Sociables were also a surprise, but they had also expired one year ago so throwing them away wasn’t too much of a struggle. I shouldn’t be surprised about the ranch dressing. In fact, I didn’t even know I had it in the fridge when I made this trip and the homemade recipe is SO much better anyway! The spritzers gave me heartburn (which is rare) so I’m glad they’re gone, but I truly enjoyed the raspberry vinaigrette. I held a moment of silence for that bottle as well (actually, I poured the dressing down the drain and kept the jar for my own Italian dressing). 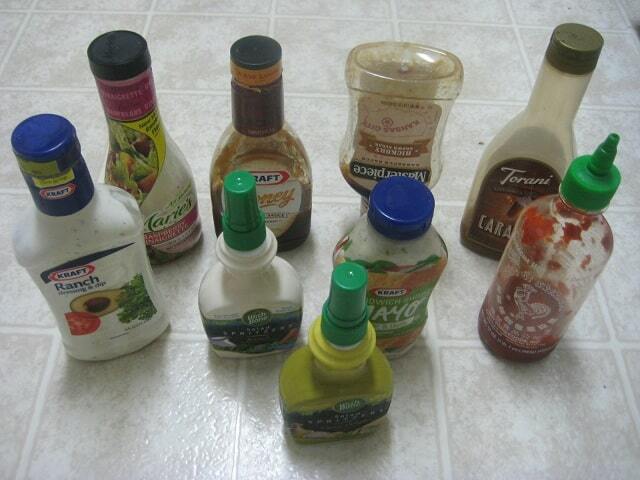 A homemade version of BBQ sauce has replaced these and homemade mayo is on my list of condiments to make too. While the fridge lost the most items, we’re lucky their loss hasn’t made much of an impact on our eating. Not pictured: Nabisco Graham Crackers. These are dearly loved by my daughter so we allowed her to finish the box in the pantry, but we’re not planning on buying them again. I know there are homemade versions available, or other cracker-snacky items (like these Annie’s Bunnies) for a treat after we’ve pumped her full of fruits and cheese. And even if I’m feeling ultra-lazy (or we want to make s’mores while camping), there’s probably a better version available somewhere. I just need to find it! What do you think? 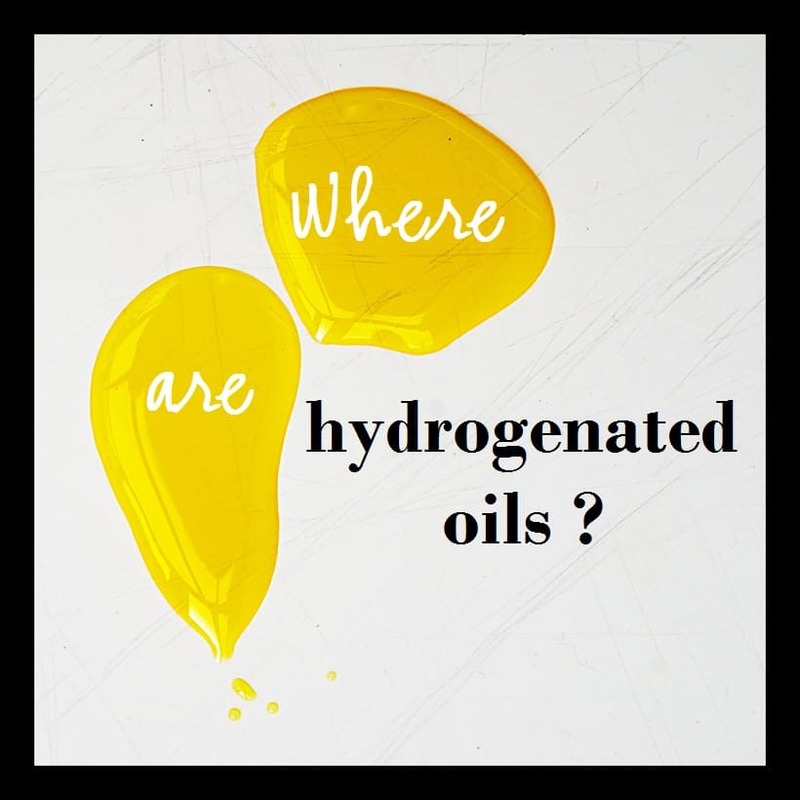 Where are hydrogenated oils hiding in your kitchen? And are you willing to throw them away? I can’t believe you threw out girl scout cookies !! A shame, I know! Small sacrifices for long term health. After reading your post about coffee creamer, I went on a binge. Gone was my Sweet Italian Cream. Moving on to oils, I am currently riding my house of all of it. Something that surprised me, apple butter that I just bought contains….HFCS. YUCK. YUCK. YUCK. Wow – good for you Denise! With fall quickly approaching, maybe now is the time to score a few pounds of apples from a local market and make apple butter in the crock pot. That’s my plan, once I figured out the canning process, lol. Cutting out the junk was the EASIEST way to slash the budget. The hardest part now is improving what’s left! Your post made me look at a box of saltines and what did I learn? A new word: INTERESTERIFIED: The interesterification process is used as an alternative to partial hydrogenation, which results in trans fats. However, research indicates that interesterified fats may pose health risks, some greater in magnitude than trans fats. Ain’t that a kick in the face? Whoa – that is NOT good. What’s the purpose of interesterification intead of hydrogenation? Thanks for the update; now I’m wondering where that stuff is hidden too! I didn’t think my husband would be on board, but after seeing a few films and reading the creamer research he was on board. We’ve also found alternative items to our favorite snacks. For example, my husband now puts peanut butter on a slice of homemade bread instead of saltines. We also look for natural and organic chips instead of the regular hydrogenated-fried variety. 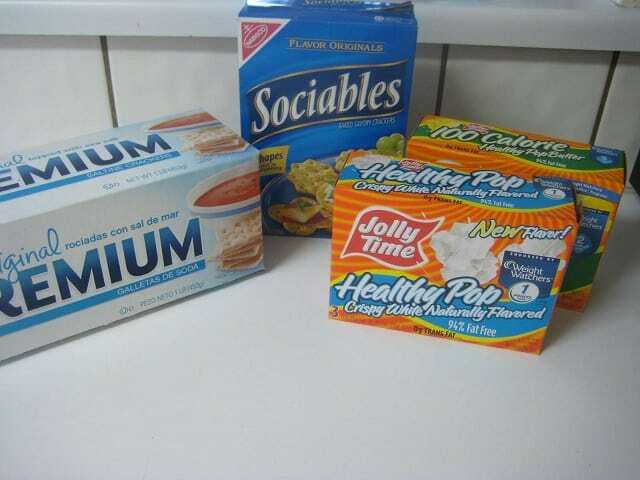 the amount of money you spend on ANYTHING processed is all profit for many layers of marketing and distribution – in manufacturing – it used to be the formula that the retail price of an item was 10 times the cost of production – with these food-like processed substances – you are looking at sometimes 20 to 30 TIMES the cost of production – so guess what? you are eating garbage that cost a tiny fraction to produce of what you pay? why not save your money and create your own REAL FOOD food with REAL INGREDIENTS?? Don’t go back to sleep…. I know I’m posting this a couple years late, and you may not even see this, but Trader Joe’s sells Honey Graham Crackers that don’t contain hydrogenated oils or HFCS. I wouldn’t call them “healthy,” and a homemade cracker would definitely be better, but at least it omits some of the worst ingredients that are found in most brands. It’s an option that may be worth considering if you’re still wanting to find an “ultra-lazy” option! BTW, I love all the information on your website. I’m purging as my husband is able to tolerate it, hehe, and this helps direct me. Thanks! !